Zain Retherford has already graduated and Jason Nolf is in his final season at Penn State. Who will be the next big NCAA stars from Pennsylvania? Well, you may not have to look far to figure it out. Over the weekend many of Pennsylvania’s young college wrestlers competed in the Edinboro Open with four coming away with Championships. Photo of Gavin Hoffman by Sam Janicki. 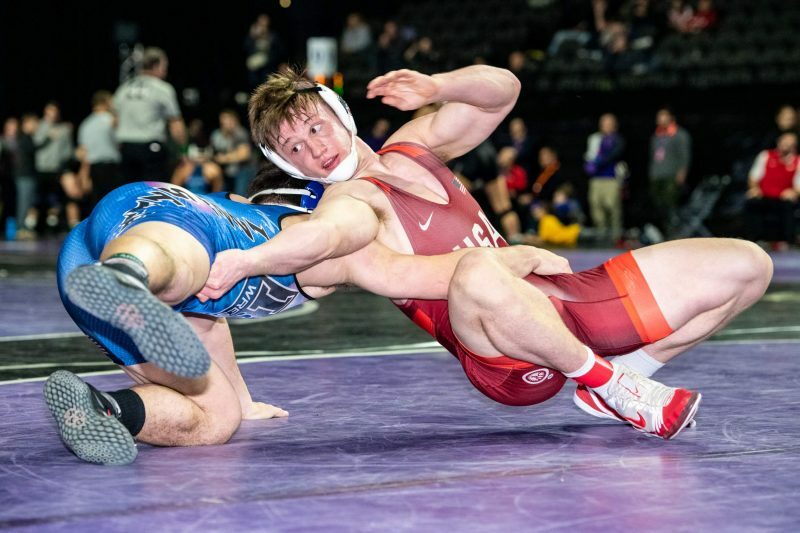 The most promising performance once again came from Ohio State freshman Sammy Sasso (Nazareth) who won the 149 pound title defeating Minnesota’s Brayton Lee in the finals (6-4). The two have a long history as Lee, an Indiana native, defeated Sasso (7-2) back in July 2017 at the Fargo Freestyle Nationals. Sasso, who was third at the Midlands this season, has been on a rampage during his redshirt campaign. His teammate and fellow Pennsylvania native Gavin Hoffman (Montoursville) joined Sasso as Champion at the Edinboro Open as the 3-time PA State Champion won the 184 pounds title. Hoffman was followed-up by Penn State gray shirt Michael Beard (Malvern Prep) who won by injury default in the 197 pound finals over Edinboro’s Dylan Reynolds (Saegertown). The fourth Champion from the Keystone State came at 141 pounds when Pittsburgh freshman Cole Matthews (Reynolds) won a rematch of the 2018 Pittsburgh Wrestling Classic. Back in March 2018 Matthews defeated Quinn Kinner of New Jersey in the PWC (5-4). This time around Matthews once again came out on top scoring a takedown in overtime to win it (3-1 SV) over the Ohio State freshman. In addition to the four Champions from Pennsylvania the Keystone State saw another eight wrestlers finish in the top six. Central Dauphin graduate and State Runner-up Chris Wright of Rider took third at 133 pounds defeating 4-time State Medalist Louis Newell (Seneca Valley) of Pittsburgh (11-2) for third place. Another PIAA State finalist, Tim Wallace (Albert Gallatin) of Kent State, took third at 184 pounds. One of the more impressive performances came at 285 pounds when high school senior Jake Slinger (Upper Saint Clair) competed and took fourth. Not too bad for a heavyweight who hasn’t even graduated high school yet. Full results can be found on the Flo Arena here.